The hotel is conceived on three virtues : Hospitality, Credibility and Integrity. 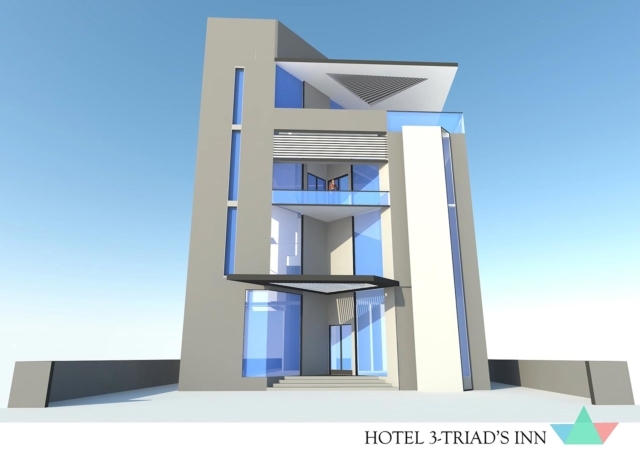 The hotel has been divided in two wings according to its functions and nature of customers. One houses a cafeteria with kitchen, entertainment hub and shops and banquet hall to cater to the travel guests while the other houses reception lobby, toilets for in-house guests, restaurants, swimming pool, saloon and spa with 18 guest rooms on third and fourth floor including 4 suites. The conflict of functions between the in- house and travel guest has been seamlessly dealt with caution with emphasis given on privacy and segregation of activities.